Wonder Boy and Monster World creator Ryuichi Nishizawa has been hard at work with Game Atelier USA to create a spiritual successor to his SEGA-owned franchises, and gameplay from the upcoming Monster Boy and the Cursed Kingdom shows that he hasn't missed a beat over the years. The original games aren't especially known for their depth, but there's an entire cult of fans who are in love with their cheerful aesthetics and bright colors. Monster Boy and the Cursed Kingdom capitalizes on that nostalgia, delivering light RPG mechanics to complement the simple combat and oh-so wonderful monster and world designs. Plus, it stars a frog with a sword, a recipe for instant success. Monster Boy is being created to bring back the enjoyment of classic games that shine by simplicity. Pure, exciting gameplay; upbeat music and smooth graphics. You'll need to overcome huge bosses, find hidden passages, discover powerful equipment and use all your wits and skills to remove a powerful curse. Its graphics do come off as a little "mobile-gamey," but that's what Game Atelier USA is best known for. The game was originally planned as a sequel to its game Flying Hamster, but after that failed at Kickstarter, Nishizawa stepped in to help salvage the project in his own light. It has improved leaps and bounds since then. The game has also moved on from its original title, Monster Boy and the Wizard of Booze. Man, that's so much better. 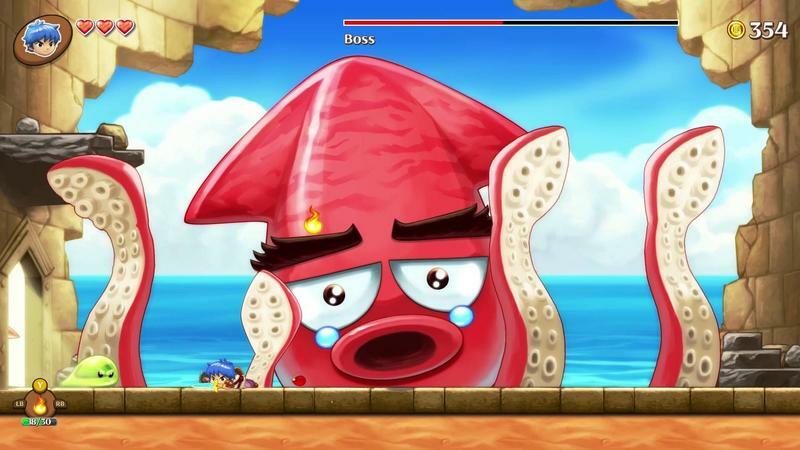 Monster Boy and the Cursed Kingdom will, however, be released for the PlayStation 4, Xbox One, and PC in 2016.